The French Engagement Office is focused on developing opportunities for South Australia arising from Australia’s $50 billion Future Submarine Program which was awarded to French company DCNS. READ the French Engagement Strategy. 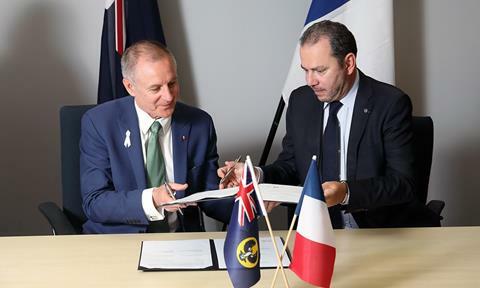 On 25 November 2016, the French Ambassador to Australia, HE Christophe Lecourtier, and Premier Jay Weatherill, signed an agreement to strengthen relationships across all sectors in the context of the decades-long submarines project. The agreement will facilitate stronger economic ties but also co-operation in education, research, tourism and the arts. “We are in a way, working together with Team South Australia, to create a kind of landing pad - the appropriate tarmac - for all these actors that are willing to come,” Ambassador Lecourtier said. 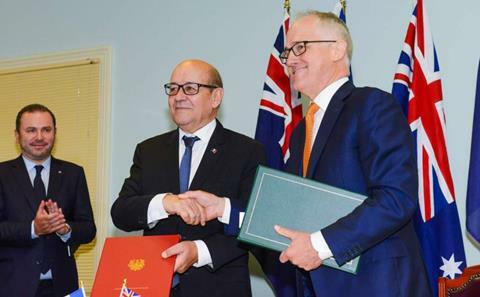 France and Australia have signed an intergovernmental strategic agreement allowing France to transfer its know-how and advanced technologies to Australia in order to reach and support a sovereign submarine capacity. French Minister for Defence, Mr Le Drian, came to South Australia in December last year to inaugurate the office of DCNS in Adelaide, and held a meeting with Premier Jay Weatherill. Set to open early 2017, the new DCNS headquarters will be dedicated to delivering the Future Submarine Program and will open with a workforce of 50. South Australia is at the heart of the rapprochement between Australia and France. The continuous enhancement of the bilateral relationships will be forged thanks to strengthened links at all jurisdictional levels: between states and regions and between cities. These new relations will create pathways for business, tourism, research and education collaborations, and cultural cooperation to build a future together. Brittany and South Australia share a wide range of industrial strengths, including shipbuilding and port activities or agribusiness. Recognising their strong economic and socio-cultural complementarity and the significant opportunity presented by the increasingly close relationship between France and Australia, the Regional Council of Bretagne and the Government of South Australia signed a letter of intent in October to build a close and enduring partnership. A sister-region agreement will facilitate the establishment of collaborative programs across various sectors, will support and encourage industrial cooperation among operators from both regions, and will open the door to broader opportunities. Ties between The City of Port Adelaide Enfield and the City of Cherbourg-en-Cotentin in France are growing strong after a visit by a delegation from the French port city in December. Cherbourg French Mayor Mr Benoît Arrivé led a delegation of officials from Cherbourg to sign a letter of intent with Port Adelaide Mayor Gary Johanson. It is the symbol of a commitment to future industry and trade relations. French ship-builder DCNS has its submarines shipyard in Cherbourg, which prompted delegation’s visit. The letter signing was also witnessed by SA’s Investment and Trade Minister, Martin Hamilton-Smith and French Ambassador Christophe Lecourtier. On 17 January 2017, Flinders University and four of France’s leading Graduate Schools of Engineering entered into a ground-breaking academic and research cooperation agreement relating to Australia’s Future Submarine Program. The agreement between Flinders and a consortium comprised of ENSTA ParisTech, École Centrale de Nantes, CentraleSupélec and École Polytechnique was signed at a ceremony witnessed by South Australia’s Minister for Higher Education and Skills, The Hon. Dr Susan Close and the Deputy Chief Executive of DCNS and the company’s general manager for Australia’s Future Submarine Program, Marie-Pierre de Bailliencourt. The Memorandum of Understanding will foster joint research projects, student and staff exchanges, and a new wave of Australian-French innovation and entrepreneurial projects related to the Future Submarine Program to be centred in Adelaide, South Australia. Highgate School & Unley High School have teamed up to deliver South Australia’s first French bilingual program, which will offer education in French and English for all reception to year 12 students by 2022. From 2017, the bilingual/binational program will flow from the primary school at Highgate to Unley High School. Reception students in the French stream will learn 80% of their lessons in French and 20% in English. The program will teach a combined French and Australian Curriculum. SA Premier Jay Weatherill and Minister Martin Hamilton-Smith, led 64 local business delegates and 33 companies from the defence, food and agribusiness sectors as they showcased their capabilities and connected with new partners in France in October 2016. Key events included the official launch of SA stand at SIAL Paris, a SA defence event, a SA Business Investment event, Euronaval international maritime trade show and a business mission. South Australia collaborates with French company Sigfox and its Australian subsidiary Thinxtra to become 1st Internet of Things (IoT) State. French global IoT network provider Sigfox, is currently rolling out its network throughout Australia and recently signed a Memorandum of Understanding with the South Australian Government, through Investment Attraction South Australia, which will assist the network’s rollout across our state. The Sigfox network will be deployed by Sydney-based company Thinxtra who have already made Adelaide a priority through the city’s established IoT and Smart City ecosystems. The network will be deployed not only in the metropolitan area, but throughout regional and rural South Australia. The South Australian Maritime Museum was the opening venue for the national tour of The Art of Science: Baudin’s Voyagers 1800-1804 exhibition. Nicolas Baudin led the most lavishly equipped voyage of exploration ever to leave France. His ships carried 22 scientists and crates of equipment. Their mission was the discovery and study of natural sciences, underpinned by the emergence of new ideas and philosophies of reason. Two artists on board, Charles-Alexandre Lesueur and Nicolas-Martin Petit, produced some of the first portraits of Aboriginal people and some of the earliest European views of Australian fauna, and marine life. Their paintings and drawings are preserved by the Museum d’Histoire Naturelle Le Havre. The exhibition brought 50 of their artworks to Adelaide, mostly for the first time since they were painted here, in South Australia. The French Engagement Advisory Group was established to support and inform the government’s engagement in broader social and cultural opportunities with France. The Group is chaired by SA Minister for Education and Child Development, Minister for Higher Education and Skills, the Hon Susan Close. Membership consists of eminent members of the local French community and SA based French companies and the Honorary Consul of France in South Australia. WHAT HAPPENED FOR OUR PARTNERS IN 2016? The French Australian Chamber of Commerce and Industry elected a new State Council for its SA chapter in November last year. 20 business men and women, with various backgrounds, have already started to give a new momentum to FACCI in South Australia to enhance French and Australian business interests. FACCI successfully held its first major public event in Adelaide in December. Minister Hamilton-Smith gave an address at this event hosted by the Chamber’s patron member, Investment Attraction South Australia. He said Investment Attraction South Australia was a key player in South Australia’s French Engagement Strategy, which included developing business relationships and opportunities through organisations such as FACCI. Last November, the Alliance Française held the Bonjour Adelaide French Market at the beautiful Unley Soldiers' Memorial Gardens. The French Market was designed to share and showcase French culture by bringing together French and French-inspired entertainment, products, cuisine and music. While the aim was to "bring France a bit closer to Adelaide", it also contributed to South Australia's cultural vibrancy, to give South Australian residents more of an understanding of the French way of life and to support local businesses. The Alliance Française also welcomed its new director, Mr Laurent Pointud. Laurent and his team are actively preparing the Alliance Française French Film Festival that will offer the very best of contemporary French cinema to South Australian residents from 30 March to 23 April, 2017. Newly-established as of November 2016, Adélaïde Accueil is an incorporated association run by volunteers, and member of FIAFE, an international Federation of French and Francophones Accueils Abroad with a network of 220 Accueils in 90 countries. Adélaïde Accueil will play a complementary role to the French Consular Agency in Adelaide. Accueil’s ambition is to assist the integration of French and French-speaking newcomers to Adelaide and South Australia. As part of their role, Accueil will propose activities, outings and social gatherings. Volunteers will also provide an introduction to Australian culture and the many facets of life in Adelaide, SA, and Australia. South Australia has been chosen to host the 68th International Astronautical Congress. The prestigious event is the world’s largest space-related conference. Around 3000 space professionals, including astronauts, heads of space agencies, engineers, scientists and innovators, are expected to gather at the Adelaide Convention Centre in September 2017. This event provides a unique opportunity for South Australia to showcase our array of space-related expertise and capabilities to a global audience and to French partners in particular. Sixty seven years after the first congress in Paris in 1950, it is a great symbol that the France-based International Astronautical Federation chose to come to Adelaide for the first time. This rendez-vous will be a great occasion to develop joint programs and partnerships between the space South Australian and French ecosystem thanks to strong complementary in research and industry. Already home to over 60 space-related organisations, South Australia is committed to developing strategies to grow the local industry and to increase research and development collaboration as well as international engagement. We are pleased to welcome French team Ag2R La Mondiale on South Australian roads again in 2017 for 19th Tour Down Under, the biggest cycling race of the southern hemisphere. 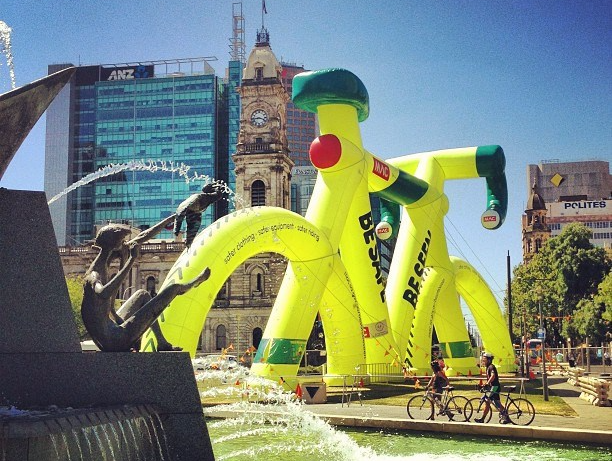 South Australia and France definitely share a same passion for cycling and Adelaide will look like a stage of Tour de France from the 14th to the 22nd of January, with its Caravane du Tour and its famous goodies. The team Ag2R La Mondiale rider roster for the 2017 Santos Tour Down Under will be led by sport director Laurent Biondi and includes riders Jan Bakelants (Belgium), Julien Berard (France), Francois Bidard (France), Ben Gastauer (Luxembourg), Clement Chevrier (France), Matteo Montaguti (Italy) and Domenico Pozzovivo (Italy). 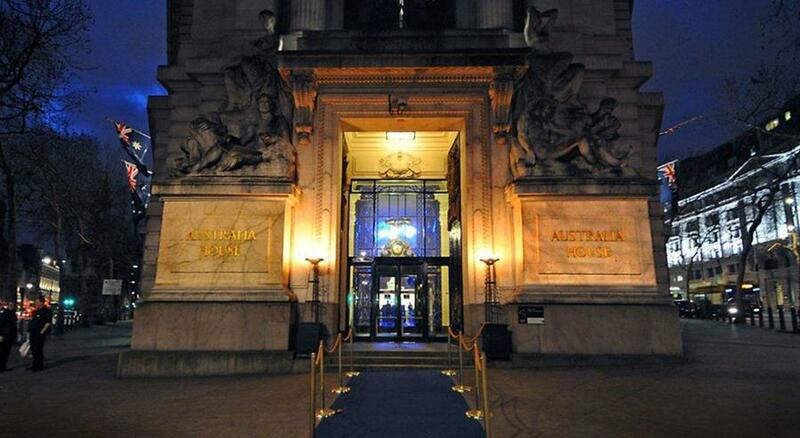 The Government of South Australia; under the banner of the South Australian Club, will host a networking event with the Regional Council of Bretagne at Australia House in London in March 2017. The event will highlight four key industries including Agriculture, Tourism, Defence and University Education. Each industry will be assigned a trade stand to display Bretagne and South Australia, highlighting the vast similarities and relationships the regions share. A cocktail reception for 200 guests, the event will act as a platform to introduce traditional Bretagne cuisine matched with South Australian beverages. Attendees will enjoy a blind cider tasting with one variety from the South Australian and Bretagne regions. We welcome your contribution to this newsletter. If you have a story you would like us to publish in next month's newsletter, please email us.